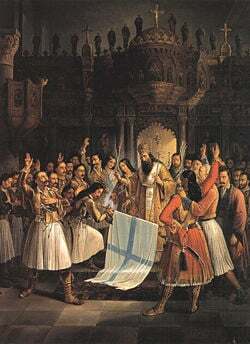 Germanos blessing the flag at Agia Lavra (depiction of a fictional account). Oil painting by Theodoros Vryzakis, 1865. The Greek War of Independence (1821–1829), also commonly known as the Greek Revolution was a successful war waged by the Greeks to win independence for Greece from the Ottoman Empire. After a long and bloody struggle, and with the aid of the Great Powers, independence was finally granted by the Treaty of Constantinople in July 1832. The Greeks were thus the first of the Ottoman Empire's subject peoples to secure recognition as an independent sovereign power. The anniversary of Independence Day (March 25, 1821) is a National Day in Greece, which falls on the same day as the Annunciation of the Virgin Mary. European support was critical but not unambiguous in aiding the revolution. A mix of romanticism about Ancient Greece as the inspiration behind much European art, philosophy and culture, Christian animosity towards Islam and sheer envy of the Ottomans combined to compel the great powers to rally to the Hellenic cause. Later, however, when other Ottoman provinces in the Balkans began to fight for their independence, support was less enthusiastic: Some powers linked the demise of the Ottomans with the fate of their own autocratic imperial projects; others preferred the status quo to the potential destabilization of the region. When the powers did intervene, it was invariably to further their own interests and agendas. Sometimes, their interests coincided with those struggling for freedom in the region but sometimes their interests clashed. As the world matures, becoming increasingly conscious of the unity of the human family, intervention should promote the good of all people within the global community and not the interests of a few. The powers spoke about liberating people from the "Turkish yoke" while denying freedom to their own colonial subjects. Duplicity and self-interest in international intervention needs to be placed under the microscope, and carefully examined. During the war, European nations expressed concern for the economic backwardness of Greece yet when, post-independence, Greece was their client state, with their own candidate on the throne, they did little to help build up its economy. Later still, they only admitted Greece to the European Union (1981) reluctantly and again for mainly strategic reasons. The Fall of Constantinople in 1453, and the subsequent fall of Trebizond (Greek: Trapezous or Trapezounda) and Mystras in 1461, marked the end of Greek sovereignty for almost four centuries, as the Ottoman Empire ruled the whole of Greece, with the exception of the Ionian Islands, the Agrafa Mountains, and the Mani Peninsula, after its conquest of the remnants of the Byzantine Empire over the course of the fourteenth and fifteenth centuries. While the Greeks preserved their culture and traditions largely through the institution of the Greek Orthodox Church, they were a subject people and lacked basic political rights. However, in the eighteenth and nineteenth centuries, as revolutionary nationalism grew across Europe, including Greece (due, in large part, to the influence of the French Revolution), the Ottoman Empire's power was declining, and Greek nationalism began to assert itself, with the Greek cause beginning to draw support not only from Western European philhellenes, but also the large Greek merchant diaspora in both Western Europe and Russia which had flourished after the Russo-Turkish War (1768–1774) and the Treaty of Kuchuk Kainarji, which gave Greek merchants the right to sail under the Russian flag. The successful rebellion of the 13-colonies in North America against what they saw as the tyranny of the British Empire also inspired the insurrection. The irony was that this revolt would attract support from the great imperial powers, despite the fact that they also ruled their empires with an iron-hand. The Greek revolution was the first of many that led to the eventual break-up of the Ottoman Empire, completed after World War I. Success of the Greek revolution inspired freedom struggles throughout the Balkans, immediately spilling over the border into Macedonia and eventually leading to the eventual independence of every European province of the Empire. The Greek Revolution was not an isolated event; there were numerous failed attempts at regaining independence throughout the history of the Ottoman occupation of Greece. In 1603, an attempt took place in Morea to restore the Byzantine Empire. Throughout the seventeenth century there was great resistance to the Turks in the Peloponnese and elsewhere, as evidenced by revolts led by Dionysius in 1600 and 1611 in Epirus. Ottoman rule over Morea was interrupted with the Morean War, as the peninsula came under Venetian rule for 30 years between the 1680s and Ottoman reconquest in 1715, after the Turkish–Venetian War; the province would remain in turmoil from then on, as over the span of the seventeenth century, the bands of the klephts multiplied. 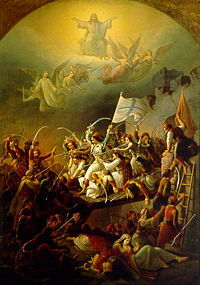 The first great uprising was the Russian-sponsored Orlov Revolt of the 1770s, which was crushed by the Ottomans. The Mani Peninsula in the southern Peloponnese continually resisted Turkish rule, enjoying virtual autonomy and defeating several Turkish incursions into the region, the most famous of which was the Ottoman Invasion of Mani (1770). At the same time, a small number of Greeks enjoyed a privileged position in the Ottoman state as members of the Ottoman bureaucracy. Greeks controlled the affairs of the Orthodox Church and the Ecumenical Patriarchate, based in Constantinople, and the higher clergy of the Orthodox Church was mostly Greek. Thus, through the Ottoman millet system, the predominantly Greek hierarchy of the Church enjoyed control over the Empire's Orthodox subjects. From the eighteenth century onwards, Phanariote Greek notables (Turkish-appointed Greek administrators from the Phanar district of Constantinople) played an increasingly influential role in the governance of the Ottoman Empire. A strong maritime tradition in the islands of the Aegean, together with the emergence over the eighteenth century of an influential merchant class, generated the wealth necessary to found schools and libraries and pay for young Greeks to study in the universities of Western Europe. Here they came into contact with the radical ideas of the European Enlightenment and the French Revolution. Educated and influential members of the large Greek diaspora, such as Adamantios Korais and Anthimos Gazis, tried to transmit these ideas back to the Greeks, with the double aim of raising their educational level and simultaneously strengthening their national identity. This was achieved through the dissemination of books, pamphlets and other writings in Greek, in a process that has been described as the "Diafotismos." lonely like lions, in the ridges of mountains? abandoning the world, due to bitter slavery? our friends, our children, and all of our kin? than forty years of slavery and jail. While some scholars stress the Ottoman history of religious toleration and suggest that former provinces of the Ottoman empire, especially in border zone contexts, might help to bridge European and Muslim civilization, the particularities of Greek-Turkish relations may mitigate against this. Not only did the Turks conquer the Greek homeland but they destroyed the Byzantine Empire which had represented a continuation both of the Roman Empire and of classical Greece into the medieval period. To some extent, leadership of the Orthodox world also shifted to Russia, which claimed to be the Third Rome. Although a significant figure within the Ottomon space, the authority of the Patriarch of Constantinople did not, under the Ottomans, extend beyond this jurisdiction. For Greeks, this was blow to their pride and sense of their place in the world. Armatolos. Water Color by Carl Haag. Central to the Greek Revolution were the Klephts (Κλέφτες) and Armatoloi (Αρματολοί). After the conquest of Greece by the Ottomans in the fifteenth century, many surviving Greek troops, whether regular Byzantine forces, local militia, or mercenaries, had either to join the Ottoman army as janissaries or serve in the private army of a local Ottoman notable, or fend for themselves. In this environment many Greeks wishing to preserve their Greek identity, Orthodox Christian religion and independence, chose the difficult but free life of a bandit. These bandit groups soon found their ranks swollen with impoverished and/or adventurous peasants, societal outcasts, and escaped criminals. Those that chose to go to the hills and form independent militia bands were called Klephts, while those that chose to serve the Ottomans were known as Armatoloi. but many men would alternate between these two groups. For the Ottomans, it became progressively more difficult to distinguish the armatoloi from the klephts; both groups began to establish relations with one another under a common ethnic identity. This collaboration was also based on mutual sentiments against foreign conquerors, and many armatoloi took up arms against the Turks at the outbreak of the revolution: among them were Odysseas Androutsos, Georgios Karaiskakis, Athanasios Diakos and Markos Botsaris. The armatoloi considered concepts of sacrifice and martyrdom honorable when fighting on the field of battle. 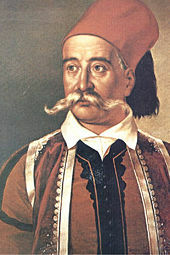 Sacrifices from individuals such as Athanasios Diakos merely continued a tradition of martyr-like efforts by armatoloi such as Vlachavas and Antonis Katsantonis. During feasts, the armatoloi would traditionally prepare for conflict with phrases such as (καλό βόλι, literally meaning "good shot") or kalo molivi (καλό μολύβι literally meaning "good lead"). In times of warfare, these wishes also took on the connotation, "May the shot that kills you be a good shot," and on a number of occasions where armatoloi were seriously wounded during battle they demanded that their own comrades bring about their death; for this group, it was better to be killed by your own kind than to be captured by the enemy. In 1814, three Greek merchants, Nikolaos Skoufas, Manolis Xanthos, and Athanasios Tsakalov, inspired by the ideas of Feraios and influenced by the Italian Carbonari, founded the secret Filiki Eteria ("Society of Friends"), in Odessa, an important center of the Greek mercantile diaspora. With the support of wealthy Greek exile communities in Great Britain and the United States and the aid of sympathizers in Western Europe, they planned the rebellion. The basic objective of the society was a revival of the Byzantine Empire, with Constantinople as the capital, not the formation of a national state. In early 1820, Ioannis Kapodistrias, an official from the Ionian Islands who had become the Russian Foreign Minister, was approached by the Society to be named leader but declined the offer; the Filikoi (members of Filiki Eteria) then turned to Alexander Ypsilantis, a Phanariote serving in the Russian army as general and adjutant to Tsar Alexander I, who accepted. The Filiki Eteria rapidly expanded, gaining members in almost all regions of Greek settlement, amongst them figures who would later play a prominent role in the war, such as Theodoros Kolokotronis, Odysseas Androutsos, Papaflessas and Laskarina Bouboulina. In 1821, the Ottoman Empire found itself occupied with war against Persia, and most particularly with the revolt by Ali Pasha in Epirus, which had forced the vali (governor) of the Morea, Hursid Pasha, and other local pashas to leave their provinces and campaign against the rebel force. At the same time, the Great Powers, allied in the "Concert of Europe" in their opposition to revolutions in the aftermath of Napoleon I of France, were preoccupied with revolts in Italy and Spain. It was in this context that the Greeks judged the time to be ripe for their own revolt. The plan originally involved uprisings in three places, the Peloponnese, the Danubian Principalities and Constantinople. The start of the uprising can be traced to on February 22 1821 (O.S. ), when Alexander Ypsilantis and several other Greek officers of the Russian army crossed the river Prut into Moldavia. Due to Greece's classical heritage, there was tremendous sympathy for the Greek cause throughout Europe. 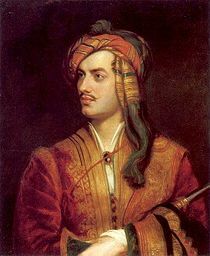 Many wealthy Americans and Western European aristocrats, such as the renowned poet Lord Byron, took up arms to join the Greek revolutionaries. Many more also financed the revolution. The Scottish historian and philhellene Thomas Gordon took part in the revolutionary struggle and later wrote the first histories of the Greek revolution in English. Use of the term "Turkish yoke" in his title reflects the popular view that the Ottomans were tyrants who exploited and oppressed their subjects, who were therefore fully justified to revolt. Rebellion against oppression may indeed be just cause for revolt but few in Europe drew parallels between how their empires treated their own subjects, even though the British had experienced the successful revolt of their 12 North American colonies and numerous revolts in Ireland. Gordon wrote of how the Greeks were "accustomed from their infancy to tremble at the sight of a Turk" while "ruin and depopulation were pressing on these hardy mountaineers" whose "hatred of their tyrants" was "untamed." Once the revolution broke out, Ottoman atrocities were given wide coverage in Europe, including also by Eugène Delacroix, and drew sympathy for the Greek cause in western Europe, although for a time the British and French governments suspected that the uprising was a Russian plot to seize Greece (and possibly Constantinople) from the Ottomans. The Greeks were unable to establish a coherent government in the areas they controlled, and soon fell to fighting among themselves. 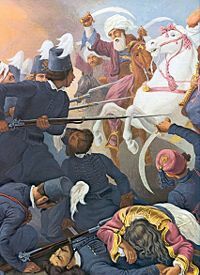 Inconclusive fighting between Greeks and Ottomans continued until 1825, when Sultan Mahmud II asked for help from his most powerful vassal, Egypt. The sortie of Messolonghi by Theodoros Vryzakis. In Europe, the Greek revolt aroused widespread sympathy among the public but was met at first with the lukewarm reception above from the Great Powers, with Britain then backing the insurrection from 1823 onward, after Ottoman weakness was clear, despite the opportunities offered it by Greek civil conflict and the addition of Russian support aimed at limiting British influence over the Greeks. Greece was viewed as the cradle of western civilization, and it was especially lauded by the spirit of romanticism of the time and the sight of a Christian nation attempting to cast off the rule of a decaying Muslim Empire also found favor amongst the western European public, although few knew very much about the Eastern Orthodox Church. Fight for Faith and Motherland! The time has come, O Hellenes. Long ago the people of Europe, fighting for their own rights and liberties, invited us to imitation… The enlightened peoples of Europe are occupied in restoring the same well-being, and, full of gratitude for the benefactions of our forefathers towards them, desire the liberation of Greece. We, seemingly worthy of ancestral virtue and of the present century, are hopeful that we will achieve their defense and help. Many of these freedom-lovers want to come and fight alongside us…. Who then hinders your manly arms? Our cowardly enemy is sick and weak. Our generals are experienced, and all our fellow countrymen are full of enthusiasm. Unite, then, O brave and magnanimous Greeks! Let national phalanxes be formed, let patriotic legions appear and you will see those old giants of despotism fall by themselves, before our triumphant banners. Instead of directly advancing on Brăila, where he arguably could have prevented Ottoman armies from entering the Principalities, and where he might have forced Russia to accept a fait accompli, he remained in Iaşi, and ordered the executions of several pro-Ottoman Moldovans. In Bucharest, where he had arrived on March 27 after some weeks delay, he decided that he could not rely on the Wallachian Pandurs to continue their Oltenian-based revolt and assist the Greek cause; Ypsilantis was mistrusted by the Pandur leader Tudor Vladimirescu, who, as a nominal ally to the Eteria, had started the rebellion as a move to prevent Scarlat Callimachi from reaching the throne in Bucharest, while trying to maintain relations with both Russia and the Ottomans. At that point, former Russian Foreign Minister, the Corfu-born Greek Ioannis Kapodistrias, sent Ypsilantis a letter upbraiding him for misusing the mandate received from the Tsar, announcing that his name had been struck off the army list, and commanding him to lay down arms. Ypsilantis tried to ignore the letter, but Vladimirescu took this to mean that his commitment to the Eteria was over. A conflict erupted inside his camp, and he was tried and put to death by the Eteria on May 27. The loss of their Romanian allies, followed an Ottoman intervention on Wallachian soil sealed defeat for the Greek exiles, culminating in the disastrous Battle of Dragashani and the destruction of the Sacred Band on June 7. Alexander Ypsilantis, accompanied by his brother Nicholas and a remnant of his followers, retreated to Râmnic, where he spent some days negotiating with the Austrian authorities for permission to cross the frontier. Fearing that his followers might surrender him to the Turks, he gave out that Austria had declared war on Turkey, caused a Te Deum to be sung in the church of Cozia, and, on pretext of arranging measures with the Austrian commander-in-chief, he crossed the frontier. But the reactionary policies of the Holy Alliance were enforced by Emperor Francis I and the country refused to give asylum for leaders of revolts in neighboring countries. Ypsilantis was kept in close confinement for seven years. In Moldavia, the struggle continued for a while, under Giorgakis Olympios and Yiannis Pharmakis, but by the end of the year, the provinces had been pacified by the Ottomans. The Peloponnese, with its long tradition of resistance to the Ottomans, was to be the heartland of the revolt. In the early months of 1821, with the absence of the Turkish governor Mora valesi Hursid Pasha and many of his troops, the situation was favorable for the Greeks to rise against Ottoman occupation. Theodoros Kolokotronis, a renowned Greek klepht who had served in the British army in the Ionian Islands during the Napoleonic Wars, returned on January 6, 1821, and went to the Mani Peninsula. The Turks found out about Kolokotronis' arrival, and demanded his surrender from the local bey, Petros Mavromichalis, also known as Petrobey. Mavromichalis refused, saying he was just an old man. Equestrian statue of Theodoros Kolokotronis in Nafplion, Greece. The crucial meeting was held at Vostitsa (modern Aigion), where chieftains and prelates from all over the Peloponnese assembled on January 26. There the klepht captains declared their readiness for the uprising, while most of the civil leaders presented themselves skeptical, and demanded guarantees about a Russian intervention. Nevertheless, as news came of Ypsilantis' march into the Danubian Principalities, the atmosphere in the Peloponnese was tense, and by mid-March, sporadic incidents against Muslims occurred, heralding the start of the uprising. The traditional legend that the Revolution was declared on March 25 in the Monastery of Agia Lavra by the archbishop of Patras Germanos is a later invention. However, the date has been established as the official anniversary of the Revolution, and is celebrated as a national day in Greece. On March 17, 1821, war was declared on the Turks by the Maniots at Areopoli. An army of 2,000 Maniots under the command of Petros Mavromichalis, which included Kolokotronis, his nephew Nikitaras and Papaflessas advanced on the Messenian town of Kalamata. The Maniots reached Kalamata on March 21 and after a brief two day siege it fell to the Greeks on the 23rd. On the same day, Andreas Londos, a Greek primate, rose up at Vostitsa. On March 28, the Messenian Senate, the first of the Greeks' local governing councils, held its first session at Kalamata. Σε δυο ημέρες χτύπησε ντουφέκι στην Πάτρα. Οι Tούρκοι κάμαν κατά το κάστρο και οι Ρωμαίγοι την θάλασσα. Shooting broke out two days later in Patras. The Turks had seized the fortress, and the Romans (Greeks) had taken the seashore. By the end of March, the Greeks effectively controlled the countryside, while the Turks were confined to the fortresses, most notably those of Patras, Rio, Acrocorinth, Monemvasia, Nafplion and the provincial capital, Tripolitsa, where many Muslims had fled with their families at the beginning of the uprising. All these were loosely besieged by local irregular forces under their own captains, since the Greeks lacked artillery. With the exception of Tripolitsa, all sites had access to the sea and could be resupplied and reinforced by the Ottoman fleet. Kolokotronis, determined to take Tripolitsa, the Ottoman provincial capital in the Peloponnese, moved into Arcadia with 300 Greek soldiers. When he entered Arcadia his band of 300 fought a Turkish force of 1,300 men and defeated them. On April 28, few thousand Maniot soldiers under the command of Mavromichalis' sons joined Kolokotronis' camp outside Tripoli. 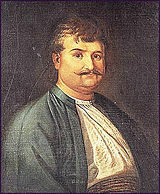 On September 12, 1821, Tripolitsa was captured by Kolokotronis and his men. The first region to revolt in Central Greece was Phocis, on March 24, whose capital, Salona (modern Amfissa), was captured by Panourgias on March 27. In Boeotia, Livadeia was captured by Athanasios Diakos on March 29, followed by Thebes two days later. The Ottoman garrison held out in the citadel of Salona, the regional capital, until April 10, when the Greeks took it. At the same time, the Greeks suffered a defeat at the Battle of Alamana against the army of Omer Vryonis, which resulted in the death of Athanasios Diakos. But the Ottoman advance was stopped at the Battle of Gravia, near Mount Parnassus and the ruins of ancient Delphi, under the leadership of Odysseas Androutsos. Vryonis turned towards Boeotia and sacked Livadeia, awaiting reinforcements before proceeding towards the Morea. These forces, 8,000 men under Beyran Pasha, were however met and defeated at the Battle of Vassilika, on August 26. This defeat forced Vryonis too to withdraw, securing the fledgling Greek revolutionaries. Cretan participation in the revolution was extensive, but it failed to achieve liberation from Turkish rule due to Egyptian intervention. Crete had a long history of resisting Turkish rule, exemplified by the folk hero Daskalogiannis who was martyred whilst fighting the Turks. In 1821, an uprising by Christians met with a fierce response from the Ottoman authorities and the execution of several bishops, regarded as ringleaders. Between 1821 and 1828, the island was the scene of repeated hostilities and atrocities. The Muslims were driven into the large fortified towns on the north coast and it would appear that as many as 60 percent of them died from plague or famine while there. The Cretan Christians also suffered severely, losing around 21 peecent of their population. As the Ottoman sultan, Mahmud II, had no army of his own, he was forced to seek the aid of his rebellious vassal and rival, the Pasha of Egypt, who sent troops into the island. Britain decided that Crete should not become part of the new Kingdom of Greece on its independence in 1830, evidently fearing that it would either become a center of piracy as it had often been in the past, or a Russian naval base in the East Mediterranean. Crete would remain under Ottoman suzerainty, but Egyptians administered the island, such as the Egyptian-Albanian Giritli Mustafa Naili Pasha. The Greek population of Macedonia participated in the war of independence but unfortunately, due to the vicinity to Constantinopolis (which was the center of the Turkish army), it did not result in success. Leader and coordinator of the Revolution in Macedonia was Emmanuel Papas , from the village of Dobista (modern day Emmanuel Papas in Serres prefecture). Papas was a member of the "Philike Etaireia" and offered a lot of funding from his personal wealth for the Cause, but wasn't a military expert himself. In the Macedonian mountains of Olympus and Vermion lived a large number of Greek klefts. The revolt "typically" started on March 1821; with Emmanuel Papas from Serres (one of the main figures, who lacked a military background) making provisions and transporting them to Mt. Athos at the orders of prince Alexandros Ipsilantis (leader, at the time, of the Greek Revolution). At Papas' request for naval support, Psara (an island of the N. Aegean) responded and provided the insurgents with sea-coverage. On the news of the Psarian landing, there were Turkish retaliations in Papas' hometown and Greek shops were sacked and Greek traders along with the metropolitan bishop were imprisoned. In Thessaloniki, too, governor Yusuf Bey, took hostages from the Greek community (civic and religious). After learning that Polygyros had joined the revolt, that Ottoman detachments were annihilated and the insurrection was spreading in the Chalkidiki and villages of Langadas, he executed several of them. Subsequently, he proceeded with a more massive slaughter of several thousands Thessalonian Greeks in the cathedral and market area. In his history D. Dankin (1972) says that it was to take over half a century for the Greeks of the city to recover from the blow. Nevertheless, the revolt gained ground and was proclaimed at the "protaton" of Karyes on May, in the district of Olympos, and was joined by Thasos. 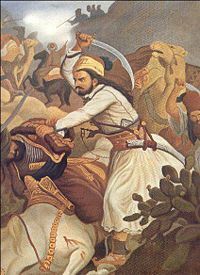 Subsequently the insurgents cut communications between Thrace and the south, and attempted to prevent Hadji Mehmet Bayram Pasha from transferring forces from E. Macedonia to S. Greece: Although delaying him, were defeated. In late October, a general Ottoman offensive lead by the new Pasha of Thessaloniki, Mehmet Emin, scored another crashing Ottoman victory at Kassandra. Papas and the survivors escaped on board the Psarian fleet to join the Peloponnesians, though the protagonist died en route. Sithonia, mount Athos and Thasos surrender on terms. In the meanwhile, the insurrection west of the Thermaic Gulf managed to spread from Olympos to Bermion and Pieria. It was conducted by Anastasios Karatasos from the district of Beroia, Angelos Gatsos from the vicinity of Edessa, Zaferakis Logothetis from Naousa, and was also assisted by the Psarian naval force. On March of 1822, the insurgents were joined by more boats from Psara and Gregory Salas, who had been appointed commander-in-chief of the campaign in Macedonia, and German philhellenes. These too, Mehmet Emin defeated at Kolindros (near Methoni); then another detachment under captain Diamantis at Kastania (inland, on the other end of the Pierian mountains) and after pushing them eastwards towards the sea, he finally dispersed them at Milia on Easter Sunday. Further north, in the vicinity of Naousa, the detachment of Karatasos, some 5,000 strong, recorded a victory, but was checked by the arrival of fresh Ottoman reinforcements, and then by Mehmet Emin himself who appeared with 20,000 regulars and irregulars. Failing to get the insurgents to surrender Mehmet Emin launched a number of attacks pushed them back and finally took their base of operations itself, the town of Naousa, on April. (The expeditionary force sent from south Greece by prince Demetrios Ipsilants arrived too late to assist Naousa and was subsequently defeated.) Reprisals and executions ensued, and women are reported to have flung themselves over the Arapitsa waterfall to avoid dishonor and being sold in slavery. Those who broke through the siege fall back in Kozani, Siatista and Aspropotamos, or were carried by the Psarian fleet to the N. Aegean islands. From the early stages of the revolution, success at sea was vital for the Greeks. If they failed to counter the Ottoman Navy, it would be able to resupply the isolated Ottoman garrisons and land reinforcements from the Ottoman Empire's Asian provinces at will, crushing the rebellion. The Greek fleet was primarily outfitted by prosperous Aegean islanders, principally from three islands: Hydra, Spetses and Psara. Each island equipped, manned and maintained its own squadron, under its own admiral. Although they were crewed by experienced crews, the Greek ships were mostly armed merchantmen, not designed for warfare, and equipped with only light guns. Against them stood the Ottoman fleet, which enjoyed several advantages: its ships and supporting craft were built for war; it was supported by the resources of the vast Ottoman Empire; command was centralized and disciplined under the Kaptan Pasha. The total Ottoman fleet size was 23 masted ships of the line, each with about 80 guns and 7 or 8 frigates with 50 guns, 5 corvettes with about 30 guns and around 40 brigs with 20 or fewer guns. In the face of this situation, the Greeks decided to use fire ships, which had proven effective for the Psarias during the Orlov Revolt in 1770. The first test was made at Eresos on 27 May 1821, when a Turkish frigate was successfully destroyed by a fire ship under Dimitrios Papanikolis. 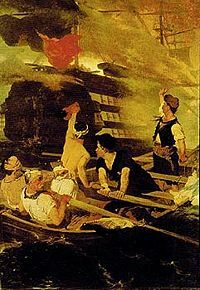 In the fire ships, the Greeks found an effective weapon against the Ottoman vessels. In subsequent years, the successes of the Greek fire ships would increase their reputation, with acts such as the destruction of the Ottoman flagship by Constantine Kanaris at Chios, after the massacre of the island's population in June 1822, acquiring international fame. Overall, 59 fire ship attacks were carried out, of which 39 were successful. At the same time, conventional naval actions were also fought, at which naval commanders like Andreas Miaoulis, Nikolis Apostolis, Iakovos Tombazis and Antonios Kriezis distinguished themselves. The early successes of the Greek fleet in direct confrontations with the Ottomans at Patras and Spetses gave the crews confidence, and contributed greatly to the survival and success of the uprising in the Peloponnese. Later however, as Greece became embroiled in a civil war, the Sultan called upon his strongest subject, Muhammad Ali Pasha the Great of Egypt, for aid. Plagued by internal strife and financial difficulties in keeping the fleet in constant readiness, the Greeks failed to prevent the capture and destruction of Kasos and Psara in 1824, or the landing of the Egyptian army at Methoni. Despite victories at Samos and Gerontas, the Revolution was threatened with collapse until the intervention of the Great Powers in the Battle of Navarino in 1827. There the Ottoman fleet was decisively defeated by the combined fleets of the Britain, France and the Russian Empire, effectively securing the independence of Greece. The Greeks held a national legislative assembly in the Peloponnese January 1822. Demetrius Ypsilanti (brother of Alexander Ypsilantis) was elected president. On November 15-20, 1821, another unrelated council was held in Salona, where the main local notables and military chiefs participated. Under the direction of Theodoros Negris, they set down a proto-constitution for the region, the Legal Order of Eastern Continental Greece (Νομική Διάταξις της Ανατολικής Χέρσου Ελλάδος), and established a governing council, the Areopagus, composed of 71 notables from Eastern Greece, Thessaly and Macedonia. Officially, the Areopagus was superseded by the central Provisional Administration, established in January 1822 after the First National Assembly, but the council continued its existence and exercised considerable authority, albeit in the name of the national government. Tensions between the Areopagus which was dominated by Central Greeks, and the National Assembly which was dominated by Peloponnesians caused an early rift in the fledgling Greek state. The relationship between the two governments was extremely tense, and Greece soon entered a phase of virtual civil war based on the regional governments. 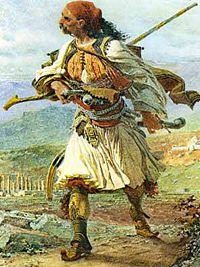 Petros or Petrobey Mavromichalis, who liberated Kalamata and defended Mani. Seeing that the Greek forces had defeated the Turks, the Ottoman Sultan asked his Egyptian vassal, Muhammad Ali of Egypt, who hailed from Kavala in today's Greece, for aid. The Egyptians agreed to send their French-trained army to Greece in exchange for Crete, Cyprus and the Peleponnese. Muhammad Ali accepted the offer and sent his son Ibrahim in command of the expedition. They planned to pay for the war by expelling most of inhabitants and resettling Greece with Egyptian peasants. Meanwhile, the Greeks were in political disarray, verging on civil war. Under command of Ibrahim Pasha, the son of the leader of Egypt, Muhammad Ali invaded Greece, landing at Methoni and capturing the city of Kalamata and razing it to the ground. With the Greeks in disarray, Ibrahim ravaged the Peloponnese and after a brief siege he captured the city of Messolonghi. He then tried to capture Nauplio but he was driven back by Dimitrios Ypsilantis and Konstantinos Mavromichalis, Petros' brother. Much of the countryside was ravaged by Egyptian troops. He then turned his attention to the only place in the Peloponnese that remained independent: Mani. From the few Greeks of Mani and the rest of Greeks who live there to Ibrahim Pasha. We received your letter in which you try to frighten us saying that if we don't surrender, you'll kill the Maniots and plunder Mani. That's why we are waiting for you and your army. We, the inhabitants of Mani, sign and wait for you. Ibrahim tried to enter Mani from the north-east near Almiro on the June 21, 1826, but he was forced to stop at the fortifications at Vergas,Mani. His army of 7,000 men was held off by an army of 2,000 Maniots and 500 refugees from other parts of Greece. Ibrahim again tried to enter Mani, but again the Maniots defeated the Turkish and Egyptian forces. The Maniots pursued the Egyptians all the way to Kalamata before returning to Vergas. This battle was costly for Ibrahim not only because he suffered 2,500 casualties but also ruined his plan to invade Mani from the north. Ibrahim would try again several times to take Mani, but each time the Turco-Arab forces would be repulsed, suffering much heavier casualties than the Greeks. On 20 October 1827, the British, Russian and French fleets, on the initiative of local commanders but with the tacit approval of their governments, attacked and destroyed the Ottoman fleet at the Battle of Navarino (Πύλος). This was the decisive moment in the war of independence, although the British Admiral Edward Codrington nearly ruined his career, since he was ordered not to achieve such a victory or destroy completely the Turko-Egyptian fleet. In October 1828, the Greeks regrouped and formed a new government under John Capodistria (Καποδíστριας). They then advanced to seize as much territory as possible, including Athens and Thebes, before the western powers imposed a ceasefire. The Greeks seized the last Turkish strongholds in the Peloponnese with the help of the French general, Nicolas Joseph Maison. Bust of Demetrius Ypsilanti at the Ypsilanti Water Tower. The final major engagement of the war was the Battle of Petra, which occurred North of Attica. Greek forces under Dimitrios Ypsilantis, for the first time trained to fight as a regular European army rather than as guerrilla bands, advanced against Ottoman forces as Greek commanders realized that under the peace terms the new state would comprise whatever parts of Greece Greek troops occupied. The Greek forces met the troops of Osman Aga and after exchanging fires, the Greeks charged with their swords and decisively defeated the Turkish forces. The Turks would surrender all lands from Livadeia to the Spercheios River in exchange for safe passage out of Central Greece. This battle was significant as it was the first time the Greeks had fought victoriously as a regular army. It also marked the first time that Turks and Greeks had negotiated on the field of battle. The Battle of Petra was the last of the Greek War of Independence. Ironically, Dimitrios Ypsilantis ended the war started by his brother, Alexandros Ypsilantis, when he crossed the Prut River eight and a half years earlier. 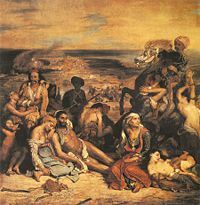 Eugène Delacroix's Massacre of Chios. Almost as soon as the revolution began, there were large scale massacres of civilians by both Greek revolutionaries and Ottoman authorities. Greek revolutionaries massacred Turks and Muslims identified with their rule inhabiting the Peloponnese and Attica where Greek forces were dominant, whereas the Turks massacred many Greeks identified with the revolution especially in Ioni] (Asia Minor), Crete, Constantinople and the Aegean islands where the revolutionary forces were weaker. Some of the more infamous atrocities include the Massacre of Chios, the Destruction of Psara, the massacres of Turks and Jews following the Fall of Tripolitsa, and the Navarino Massacre. Harris J. Booras and David Brewer claimed that massacres by Greeks were responses to the prior events (such as the massacre of the Greeks of Tripoli, after the failed Orlof revolution of 1770 and the destruction of the sacred band). However, according to historians W. Alison Phillips, George Finlay, William St. Clair and Barbara Jelavich massacres started simultaneously with the outbreak of the revolt.Cite error: Closing </ref> missing for <ref> tag The country had been ravaged by ten years of fighting, was full of displaced refugees and empty Turkish estates, necessitating a series of land reforms over several decades. The new state also contained 800,000 people, fewer than one third of the two and a half million Greek inhabitants of the Ottoman Empire and for much of the next century the Greek state was to seek the liberation of the “unredeemed” Greeks of the Ottoman Empire, in accordance with the Megale Idea, the goal of uniting all Greeks in one country. As a people, the Greeks no longer provided the princes for the Danubian Principalities and were regarded within the Ottoman Empire, especially by the Muslim population, as traitors. Phanariotes who had up to then held high office within the Ottoman Empire were thenceforth regarded as suspect and lost their special, privileged category. In Constantinople and the rest of the Ottoman Empire where Greek banking and merchant presence had been dominant, Armenians mostly replaced Greeks in banking and Bulgarian merchants gained importance. In the long term historical perspective, this marked a seminal event in the collapse of the Ottoman Empire, despite the small size and impoverishment of the new Greek state. For the first time, a Christian subject people successfully rebelled against the Ottoman Empire and established a fully [independent state, recognized by Europe. This would give hope to the other subject peoples of the Ottoman Empire, as Serbs, Bulgars, Romanians, and Arabs would all successfully throw out the Turks and establish free states. European support, however, for the break-up of the Ottoman Empire was always cautious and self-serving. On the one hand, they condemned the tyranny of the Ottomans while on the other they treated their own colonies no better than the Ottomans treated theirs. Austria-Hungary thought that the downfall of the Ottomans as an imperial entity governed similarly to their own empire might be an ill omen for their own survival. By the end of the nineteenth century, Germany was allied with the Ottomans and even Britain, for all her rhetoric about the "Turkish peril" preferred to leave the Balkans in Turkish hands rather than destabilize the region. With respect of the Greek revolution, the mix of romanticism, belief in the superiority of Western civilization and their somewhat duplicitous rhetoric about freedom was too powerful for the great powers to withhold support. European integration has focused, historically on, among other things, the Catholic and Protestant civilization and the strategic alliance with North America … Europeans have been reluctant to accept new members from the peripheral zone of contact with Islam … The Western Christians of the Czech Republic, Poland, Hungary, Slovenia, Malta, and the three Baltic states were easily accepted, while any "Orthodox" completion of the Union has always been regarded with suspicion, and endorsed for primarily strategic reasons. The European Community accepted Greece in 1981 in order to bolster its young democratic institutions and reinforce the strategic Southern flank against the Communist bloc. Yet diplomatic gossips in Brussells targeted, for years, the inclusion of Greece as an anomalous member who received much, contributed little and caused trouble. Apostolov prefers to see the former Ottoman space and other civilizational frontier zones as bridges between civilizations, not as barriers, arguing throughout his book that such zones can be venues for conflict or for cooperation depending on the agenda of those who preserve the collective memory, stressing episodes of harmony or of hostility. ↑ Kyriakos D. Kassēs, Mani's History (Athens, GR: Presfot, 1979), 29. ↑ 3.0 3.1 3.2 3.3 Steven W. Sowards, Twenty-five Lectures on Modern Balkan History (The Balkans in the Age of Nationalism), Michigan State University. Retrieved August 10, 2008. ↑ D. Alexandris, Great Britain and the Eastern Question - The case of the Greek War of Independence 1821-1828, Military Photos. Retrieved August 10, 2008. ↑ Ioannis Makrygiannis, "Memoirs," Book A, Chapter I, Athens, 1849 (Greek). snhell.gr. Retrieved August 10, 2008. ↑ 12.0 12.1 12.2 12.3 Kassis (1979), 39. ↑ Harris J. Booras, Hellenic Independence and America's Contribution to the Cause (Rutland, VT: Tuttle Co., 1934), 24. Apostolov, Mario. 2004. The Christian-Muslim Frontier a Zone of Contact, Conflict, or Cooperation. London, UK: RoutledgeCurzon. ISBN 9780203493861. Brewer, David. 2001. The Greek War of Independence: The Struggle for Feedom from Ottoman Oppression and the Birth of the Modern Greek Nation. Woodstock, NY: Overlook Press. ISBN 9781585671724. Clogg, Richard. 1976. The Movement for Greek independence, 1770-1821: A Collection of Documents. New York, NY: Barnes & Noble. ISBN 9780064912167. Gordon, Thomas. 1844. 2000, History of the Greek Revolution: And of the Wars and Campaigns Arising from the Struggles of the Greek Patriots in Emancipating Their Country from the Turkish Yoke. Boston, MA: Adamant Media Corp. ISBN 978-1402182563. Jelavich, Barbara. 1983. History of the Balkans, 18th and 19th Centuries. New York, NY: Cambridge University Press. ISBN 0521274583. Kassēs, Kyriakos D. 1979. Mani's History. Athens, GR: Presfot. Paroulakis, Peter H. 1984. The Greeks: Their Struggle for Independence. Darwin, NT: Hellenic International Press. ISBN 9780959089400. Paroulakis, Peter H. 2000. The Greek War of Independence. Darwin, AU: Hellenic International Press. ISBN 9780959089417. History of "Greek War of Independence"
This page was last modified on 14 July 2017, at 23:13.